St James's Palace has confirmed it contacted the Press Complaints Commission (PCC) over the possible use of naked photos of Prince Harry. It believed publication of the photos - taken in a Las Vegas hotel room - would constitute an invasion of privacy. Meanwhile, the Met Police have said they will not discuss "matters of protection" after concerns were raised. Commissioner Bernard Hogan-Howe was asked on Wednesday about the images and the role of the prince's protection officers - which are provided by the Met - and said: "Protection officers are there to protect him for security reasons, they are not there to regulate his life." St James's Palace confirmed the prince is in the photos and that it contacted the PCC on Wednesday because it had concerns about his privacy being intruded upon, in breach of the editors' code of practice. A PCC spokesman said there was no formal complaint but confirmed St James's Palace contacted the regulatory body so it could raise concerns with editors. 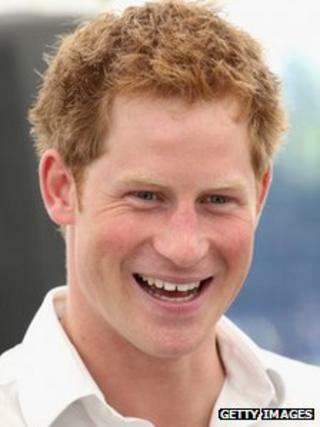 "They thought Prince Harry had a reasonable right to privacy, being in a private hotel," the spokesman said. TMZ reported Harry had been pictured in a group playing "strip billiards". The pictures have been picked up by much of the US media but no British newspaper has published them, although they have appeared on a political blog in the UK and the Sun mocked up an image of one of them on its front page. On Wednesday evening they appeared on Scottish media and marketing website, the Drum, alongside an opinion piece from the editor saying "decisions not to publish, despite the self-evident news value, are always bad decisions". One ex-editor said the decision by UK newspapers not to use the photos showed the Leveson Inquiry had "neutered" the press. Former News of the World executive editor Neil Wallis told the BBC that before the Leveson Inquiry he would have published the pictures because it was in the public interest, but the inquiry had had an adverse effect on the press. British papers may not have printed the pictures of Prince Harry, but they have reported the furore in full detail - and told readers where they can find the photos, which first surfaced on the TMZ entertainment website in the US. In the past, some papers would have happily countered this with claims that the story was in the public interest, pointing out the risk posed to the prince's security. But for the moment, newspapers are playing safe, waiting for Leveson. That has not stopped them discussing the full implications of Prince Harry's behaviour. It's a salutory reminder of the difficulty for Lord Justice Leveson in devising a tighter form of press regulation for the UK in a world where social media and the internet respect no boundaries. Whatever the Leveson Report says when it is published this autumn, it is certain to spark a new round of arguments about what sort of a press - and regulation - the UK wants. "He is third in line to the throne, he's been on the world stage for weeks and weeks, he is supposedly surrounded by police security officers," he said. But media lawyer Mark Stephens said editors realised they had to comply with the wishes of St James's Palace. "It's because they were asked not to by the PCC and they accepted it was probably the better way to go," he said. He added that a number of high profile court cases involving celebrities had changed the way the press handle privacy. Media lawyer Callum Galbraith said the press would have weighed up the prince's privacy rights, against the media's right to publish, before using the pictures. Mr Galbraith said: "The photos appear to have been taken in the most private of circumstances. Naked photos are, of course, inherently private. "In addition, it is likely that the prince did not consent to the taking of photos. "The suggestion that the Leveson Inquiry may be responsible for the UK media not publishing these photos is unfair and inaccurate. The media would always be cautious of such photos." Former royal protection officer Ken Wharfe described the incident as a setback for the prince, undermining the charitable work and his military career. BBC media correspondent Torin Douglas said it was a "reminder of the difficulty for Lord Justice Leveson in devising a tighter form of press regulation for the UK, in a world where social media and the internet respect no boundaries". "There has never been a better time for the third in line to the throne to be photographed naked, with naked company, in a Las Vegas hotel room," said a Times leader, pointing out that Harry's recent "triumphant" Caribbean tour and "dutiful but joyful turn" at the Olympic Games earned him "a special place in the nation's heart". Media captionNeil Wallis: "[In the] post-Leveson era newspaper editors are simply scared of their own shadow"
But he will need to tread carefully in the future. "It is a testament to his sheer likeability that Britain will most likely greet his latest, literal, revelations with a grin and an indulgent shrug. If he's still naked at 50, things may be different." The Daily Mirror's Alison Phillips wrote: "Unlike the royal stuffed shirts, he seems genuine and a bit of a laugh. Which is why it was so disappointing when his aides called in lawyers to ban the pictures from UK newspapers - even though they're being published in Ireland." Prince Harry "wasn't hurting anyone", she said, and he had "done us proud recently". Perhaps his aides needed to "follow his example and just chill out". But for the Daily Mail's Amanda Platell, his recent achievements and image clean-up have made the Las Vegas scenes "so disappointing and genuinely shocking". The prince should have known better, she said, and questioned why no courtier or police protection officer stepped in.